If you’re an aspiring biathlete under the age of 16, see the forwarded content for information about an upcoming camp during the SoHo World Cup time frame. 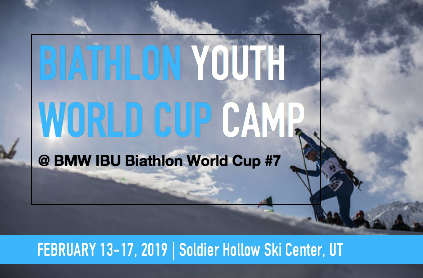 USBA is hosting a 5-day biathlon camp during the SoHo World Cup this February 13-17 for youth athletes aged 14-15 years old! Cross country ski racing experience required; biathlon experience preferred. This is an exciting opportunity to train with Tim Burke and experience the highest level of biathlon first hand. Click the yellow button for details and registration information. Registration deadline is January 13th, 2019. Spread the word! Max capacity of 15 athletes. This email originally contained a link to a website that has been determined to be a security threat. It is possible that the sender did not realize that the website was a security threat. For the protection of your computer and the CU Boulder network, the link was removed. If you believe the website is not a security threat and that our determination was made in error, please contact the IT Service Center at help at colorado.edu<mailto:help at colorado.edu> or call 303-735-4357 (5-HELP from a campus phone). To learn more about CU Boulder's email filtering services, please visit https://oit.colorado.edu/email/spam.